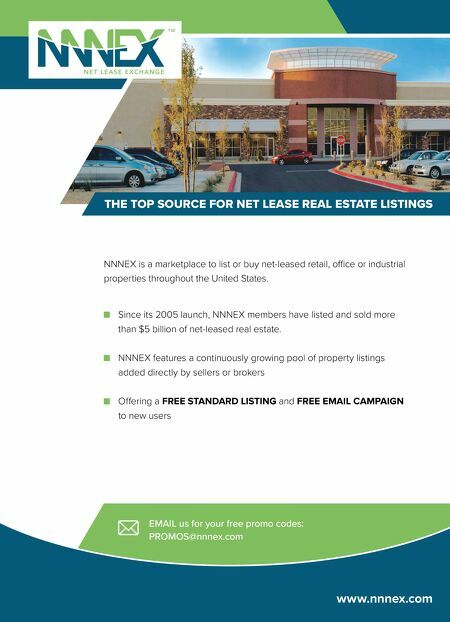 14 • SHOPPING CENTER BUSINESS • August 2018 NEWSLINE Marshalls, Shoe Carnival, Dollar Tree and Hibbett Sports. The center also includes an outparcel that is home to Wingstop and Pizza Hut. HFF SECURES SALE, FINANCING FOR ALAFAYA COMMONS IN ORLANDO HFF has secured the $19.8 million sale of Alafaya Commons, a 130,811-square- foot retail center in Orlando. Brad Pe- terson and Whitaker Leonhardt of HFF arranged the transaction on behalf of the seller, Regency Centers. Rebecca Van Re- ken and Gregg Shapiro of HFF secured a $13.7 million acquisition loan through First Florida Integrity Bank on behalf of the buyer, LBX Investments. The five-year loan features a fixed interest rate. 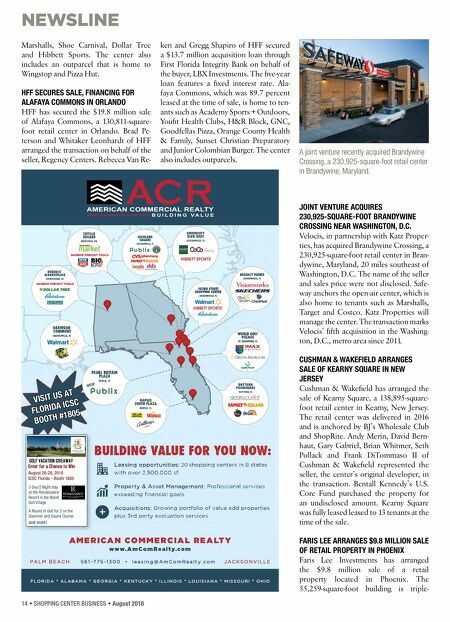 Ala- faya Commons, which was 89.7 percent leased at the time of sale, is home to ten- ants such as Academy Sports + Outdoors, Youfit Health Clubs, H&R Block, GNC, Goodfellas Pizza, Orange County Health & Family, Sunset Christian Preparatory and Junior Colombian Burger. The center also includes outparcels. JOINT VENTURE ACQUIRES 230,925-SQUARE-FOOT BRANDYWINE CROSSING NEAR WASHINGTON, D.C. Velocis, in partnership with Katz Proper- ties, has acquired Brandywine Crossing, a 230,925-square-foot retail center in Bran- dywine, Maryland, 20 miles southeast of Washington, D.C. The name of the seller and sales price were not disclosed. Safe- way anchors the open-air center, which is also home to tenants such as Marshalls, Target and Costco. Katz Properties will manage the center. The transaction marks Velocis' fifth acquisition in the Washing- ton, D.C., metro area since 2011. CUSHMAN & WAKEFIELD ARRANGES SALE OF KEARNY SQUARE IN NEW JERSEY Cushman & Wakefield has arranged the sale of Kearny Square, a 138,895-square- foot retail center in Kearny, New Jersey. The retail center was delivered in 2016 and is anchored by BJ's Wholesale Club and ShopRite. Andy Merin, David Bern- haut, Gary Gabriel, Brian Whitmer, Seth Pollack and Frank DiTommaso II of Cushman & Wakefield represented the seller, the center's original developer, in the transaction. Bentall Kennedy's U.S. Core Fund purchased the property for an undisclosed amount. Kearny Square was fully leased leased to 13 tenants at the time of the sale. FARIS LEE ARRANGES $9.8 MILLION SALE OF RETAIL PROPERTY IN PHOENIX Faris Lee Investments has arranged the $9.8 million sale of a retail property located in Phoenix. The 55,259-square-foot building is triple- A joint venture recently acquired Brandywine Crossing, a 230,925-square-foot retail center in Brandywine, Maryland. VISIT US AT FLORIDA ICSC BOOTH #1805 August 26-28, 2018 ICSC Florida - Booth 1805 3 Day/2 Night stay at the Renaissance Resort in the World Golf Village A Round of Golf for 2 on the Slammer and Squire Course and more!